HSP90s are abundant and highly specialized molecular chaperones crucially involved in several signalling pathways. They primarily exist as homodimers whose activity is regulated by ATP. Dimerization is essential for the vital functions of HSP90s 95. Nevertheless, higher oligomeric states including hexamers have been reported 96. It has been shown previously that oligomerization is induced after heat shock and in the presence of non-ionic detergents 97, 98. Oligomerization especially occurs in the presence of divalent cations, nucleotides, and higher Hsp90 concentrations 46, 99, 100, 101 enhancing substrate binding and preventing irreversible aggregation 102, 103. Almost all Hsp90 homologs show an identical domain architecture with three well-defined domains (Figure 1+2): a highly conserved N-terminal nucleotide binding domain (NTD) responsible for ATP-binding and hydrolysis, a middle domain (MD) which completes the ATPase site necessary for ATP hydrolysis and binds client proteins, and a highly conserved C-terminal dimerization domain (CTD) with the pentapeptide M-E-E-V-D sequence 22. Critical amino acids within NTD directly involved in interaction of yeast Hsp90 with ATP are Asn37, Asp79, Lys98, and Phe124 (Figure 1). The ATP-binding domain within the NTD further represents the binding site of diverse natural substances such as the antibiotics radicicol and geldanamycin that promote degradation of protein kinases and interfere with Hsp90 functions 104, 105. In eukaryotes, a short charged region of about 50 amino acid residues links the NTD and the CTD 106. This region varies in both, length and composition among species and isoforms with being entirely absent in mammalian Trap-1 and bacterial HtpG 106. Although the charged linker is not essential for Hsp90 function, it is crucially involved in coordinating the NTD and CTD to maintain the conformation of Hsp90 binding with ATP. In this context, Dixit and Verkhivker reported on the ability of the inter-domain charged linker to regulate Hsp90 allosteric signalling in conjunction with the MD 107. The MD contains a catalytic domain able to accept the γ-phosphate of ATP leading to the characterization of Hsp90 as being a “split ATPase” 108. Structural and functional similarities between Hsp90 and DNA topoisomerase II (gyrase B) led to the suggestion that the MD represents a primary binding site for client proteins including Akt, p53, and eNOS 109, 110, 111. The CTD not only harbours the dimerization site but also the binding site for calmodulin and other co-chaperones 1, 48, 95, 101, 112. 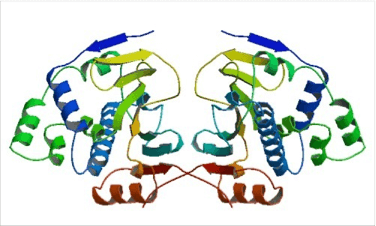 The CTD of eukaryotic cytosolic HSP90s contains a conserved five peptide motif (M-E-E-V-D) involved in binding of co-chaperones and other HSPs haboring a tetratricopeptide repeat (TPR) domain 20, 41. Similarly, eukaryotic cytosolic HSP70s also contain a G/P-rich C-terminal region harbouring an E-E-V-D motif responsible for the interaction with TPR-containing proteins 113, 114. Members residing in certain subcellular compartments bear an N-terminal localization signal while the ER-specific Grp94 (HspC4) contains the C-terminal ER retention signal K-D-E-L 115. 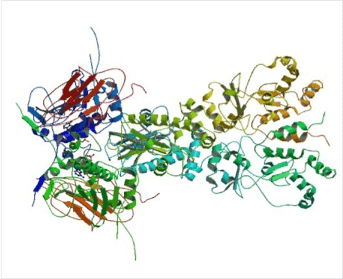 In recent years several structural studies of Hsp90 provided considerable progress to the mechanistic understanding of this chaperone machine. The structure of the yeast Hsp90 bound to the ATP analogue AMP-PNP and to the co-chaperone p23 provided insight into the ATP-bound state, while crystallographic studies of the E. coli Hsp90 HtpG made a picture of the nucleotide-free and the ADP-bound state 21, 22. These findings demonstrate that Hsp90 can adopt different nucleotide-triggered conformations. Those conformational changes are conserved from humans to bacteria 53 and most likely linked to substrate interaction 116, 117. Hsp90 is a rather dynamic and plastic molecule whose chaperone activity has been linked structurally to a “molecular clamp” 118. In the absence of bound nucleotides, the C-termini of two Hsp90 monomers interact thereby forming an antiparallel homodimer (Figure 3a). Concurrently, the N-termini of the Hsp90 homodimer preserve an open-state facilitating the capture of client proteins 119. ATP-binding to the open structure induces conformational changes of the N-termini resulting in closing of a “lid” over the bound nucleotide followed by association of N-terminal domains (Figure 3b). Continued rearrangements of the closed conformation allow interactions of the N-terminal and middle domains resulting in the ‘closed and twisted’ conformation which is able to hydrolyze ATP (Figure 3c) 22. After ATP hydrolysis the lid opens, the N-terminal domains dissociate and ADP is released thereby returning Hsp90 to the open nucleotide-free conformation 50. At present it is an open question to which extent the nucleotide state alone is able to deﬁne speciﬁc conformational states since the Hsp90 homodimers have been found to exist in a dynamic equilibrium between open, closed and intermediate conformations 53, 107, 118, 120, 121. Noteworthy, several client recruiter co-chaperones such as Sgt-1 (suppressor of G2 allele of SKP1) and Rar-1 (required for Mla-12 resistance) were shown to orchestrate global changes in the Hsp90 dynamics and stability affecting ATPase activity and recruitment of client proteins 121.